A Long Way to Tipperary – Find You in the Sun – A daughter's slow waltz with her mother's dementia. She rested her head on my shoulder like a child in need of a good read. We hummed along to Irish tunes floating through the halls. I flipped through the pages of a worn Redbook magazine, Mom occasionally reading whatever words were in large print. When I landed in the Food section, a few colorful dinners caught her eye. Tagliatelle with Peas. Sicilian Pasta. She read each headline, and I read the recipe below it. “Oh my, that sounds a bit tart for me.” “Too salty.” My comments, not hers. Instead, Mom took a page between finger and thumb, and tore one page then the next from the binding. It was a joy-filled exchange after a long day. I had spent the morning and part of the afternoon at Refresh Your Soul, an Alzheimer’s and dementia care conference sponsored by Episcopal Retirement Services, listening with rapt attention to several inspirational speakers give rise to their own journeys. I hadn’t planned to visit Mom afterwards. And yet, on those days, surprises emerged. If I arrived with cookies, expecting gratitude, or if I showed up with photos for her to view, my best laid plans, together with Mom and I, completely melted down. But in the rare instances for which I had no plan, were the brightest lights. The conference had absorbed so much mental space, and offered me many writing prompts, that I preferred to be home. 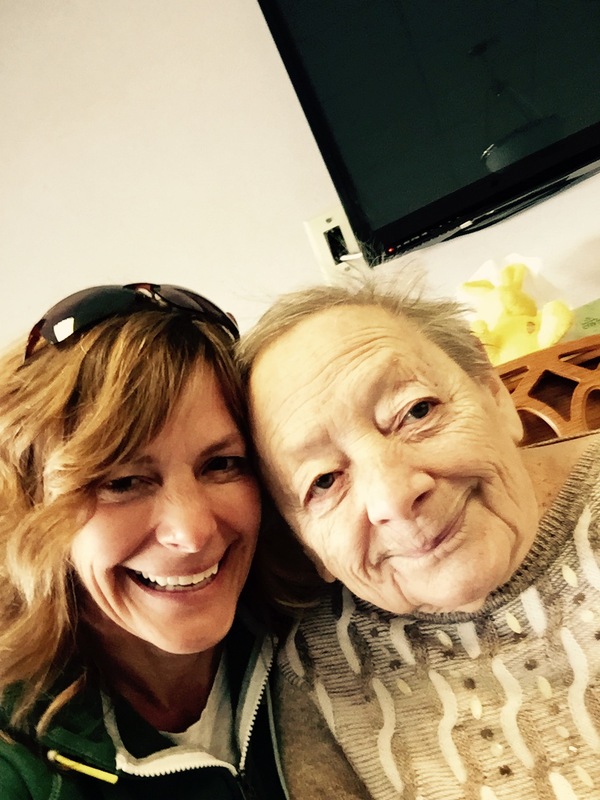 Oftentimes, I struggled with writing about Mom so she will live on in my memory versus sitting with her in the present while she is still alive. I decided on the latter. After the conference ended, I drove a few miles up the highway to see Mom. As I exited the ramp, I careened around the curve, only to find an abandoned car on the side of the road with a familiar sticker on the bumper. Women Writing for a Change. My car sported one too. I looked up ahead and spotted two forms walking along the burn. I rolled down my window. “Hey! Angela! What’s going on?” I was full of amazement that I actually knew one of the persons. “Oh, I ran out of gas.” Angela looked at me like my appearance was the most natural event the world at that moment. Maybe she was a more fervent believer in Fate than I was. “Well, hop in. I’ll take you and your son to the station.” The station was in view, and was technically only a half-mile away. She introduced me to her son, and we sped off to the station. Her eighth-grade son and I waited for her to procure a gas can, having typical awkward conversations. Then, I drove she and her son as close to the car as I could come, given the access ramp. I steered back into the flow of traffic, remembering I hadn’t even planned to drive that stretch that day. Paying attention to the small things, I was where I was supposed to be for the minute, the day, the month. Back to Mom. I had found her sleeping in a kitchen chair. She always did gravitate to upright chairs. She found some comfort for her aching hips by sitting in proper posture. She and I had walked for bit, listened to the Merry Moores Duo, and found ourselves navigating a number of magazines. Mom’s eyes grew wide as she perused the meal section of the Redbook periodical. She rarely ate meals that resembled gourmet. Much of her meal was pureed (soft mechanical), which still left some wiggle room for cookies. She’s never challenged in digesting cookies. After we leafed through the Food section, and discussed our likes and dislikes for each dish, Mom laid her head on my shoulder again, as if she had consumed an entire meal and now prepared for sleep. Sleep was coming on full-steam. So, I let her fall while my mind drifted back to the conference speaker. John O’Leary, author of On Fire, posed a few questions to ask ourselves each day, and offered suggestions on how to reframe the answers given back to ourselves. “Why me?” What about my life had offered the opportunity to care for Mom? And what blessing could I find in the day when given this opportunity? John asked the audience to meditate on the question of gratitude while he sat to the play the piano. To understand what an accomplishment that was, one needs to know that John, as a nine-year-old, suffered third-degree burns over 100% of his body. Both his hands had been amputated. But his mother insisted he continue his piano lessons, for five more years. John played “Memories” in the most hauntingly beautiful, but painstaking fashion. The audience closed their eyes and went quiet. Participants were next prompted to answer “why me” and write to the gratitude that can be found in the disease of forgetting. What had come into one’s life, as a caregiver, that wouldn’t have come otherwise? My tablemate generated a list of ten thoughts. Another young tablemate drew a blank, as tears continued to flow down her cheeks from the piano music. She was more a hearer than a talker or writer, she confessed. I didn’t hesitate. And not because I was a writer. I wrote furiously because I had been in the midst of experiencing Mom’s Renaissance, Part Two. Or Part One-Thousand. I had lost count how many of those she had. I turned giddy as she turned more giddy, and I became like Buddha with all sorts of wisdom to offer. To witness the transformation of my mother from an older person with a disease into a human being. Not her actual transformation, but the one I am experiencing with my own eyes. Mom fidgeted when she heard a loud noise in the hallway, breaking my trance. “Mom,” I whispered to wake her up. “Yes?” she whispered back in a game of telephone. “Okay, honey.” She took my chin in her hands and kissed me on the lips. “Oh, you call everyone honey these days.” I shook my head. “Yes, you’re right,” she confirmed without understanding my context, only hers. “Ciao, bella,” I said, as last my goodbye, and we threw each other kisses with our hands. Mom’s last months of 2016 had been hellish. My first months of the year, busy. But she and I had settled back into our rhythms, though not necessarily as mother-daughter. And not always as caregiver-loved one. We had simply become me and you. It was a long way to Tipperary to the sweetest gal I know. And if our time together offered the opportunity to witness her transformation, surely her gift had been to witness mine. Annette, my Mom passed away at Arden Courts, Anderson in late July. Your blog entries always resound with me, this one especially so. Thank you so much for sharing your journey. What a touching post…it’s all how we look at things. Why me? Why me? Say one upset and say one with excitement. A world of difference and yet both are needed. Keep on your journey…You have so many following in the steps. Lovely, Annette! Angela told me about the gas incident! So funny — she said you pulled up just after she prayed to God for help!